Top : Designers : Design Support Services : Bluewater Designs, Inc.
Bluewater Designs, Inc. (BDI) is a naval architecture and marine engineering firm which provides comprehensive services encompassing all aspects of vessel design, engineering, and analysis for the marine industries. BDI integrates traditional naval architecture and marine engineering practices with state of the art technologies to develop innovative and functional designs that meet the specific requirements of our clients. Web Site Snapshot: If available, above is a snapshot of the Bluewater Designs, Inc. web site at http://www.bwdinc.com as it appeared when this site was added to the directory or last verified. Please Note that Boat Design Net has no involvement with the above web site; all content and images depicted in the above thumbnail are the property and copyright of Bluewater Designs, Inc. unless otherwise noted on that site. 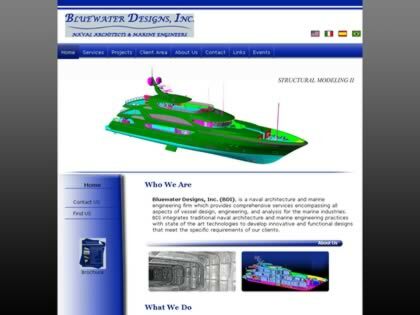 Description: Bluewater Designs, Inc. (BDI) is a naval architecture and marine engineering firm which provides comprehensive services encompassing all aspects of vessel design, engineering, and analysis for the marine industries. BDI integrates traditional naval architecture and marine engineering practices with state of the art technologies to develop innovative and functional designs that meet the specific requirements of our clients.